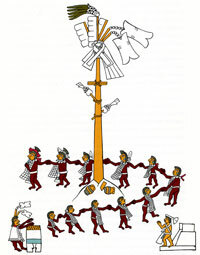 ‘Another ceremony, curious because of the resemblance it bears to certain popular European festivals, was celebrated during the month of Xocotlhuetzi. During the preceding month the people went into the forest and cut a very tall tree, approximately 15 meters in height, perfectly straight and so great in circumference that a man could not reach around it. 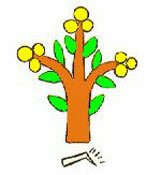 With much ceremony they brought this tree, called xócotl, from the forest, dancing and singing to it as if it were a god, carrying it upon other logs so that the bark would not be injured. When they drew near the city, the women of the nobility came out to receive them, with jugs of chocolate and with garlands of flowers which they hung upon the necks of the bearers. ‘Later they dug a hole in the plaza and set the xócotl in it. On the upper part of the trunk they tied two logs together to form a cross, and from the seed of the amaranth tree they made an image of a god. 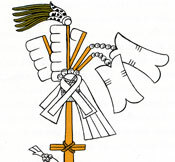 They clothed the image in white paper garments and decorations, and these great strips of paper of varying length fluttered in the breeze like pennants. Also hanging from the tree were heavy ropes which reached almost to the base. 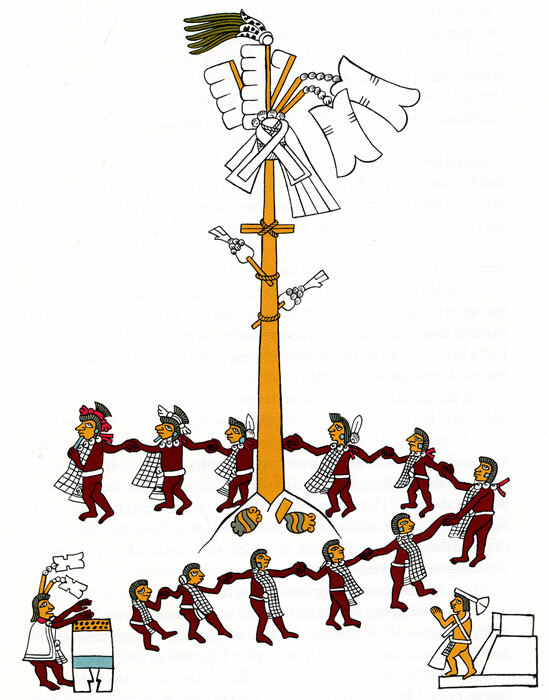 ‘When all the other ceremonies for the month of Xocotlhuetzi were completed, the people ran to the plaza where the tree stood. At its foot the leaders of the young men were stationed to prevent anyone from getting a head start, beating off the boldest to keep them from taking advantage of their companions. But when the signal was given for the game to begin, all the youths rushed forward as one and tried to climb the ropes to the top of the trunk where the amaranth-seed image of the god had been placed. ‘Veritable clusters of youths hung from each rope, for all were eager to attain the great honour of reaching the image first. Those who were shrewd waited until the ropes were swarming with men and then, climbing up over the shoulders of one after another, made their way to the highest point, reaching it ahead of the more impatient ones. The first youth to reach the top seized the idol, together with its shield, darts, dart hurler, and several large pieces of bread, or tamales, made from the same paste as the idol, and broke the image and the bread into small pieces and scattered them over the heads of the people in the plaza below. Everyone attempted to catch a piece, even though it was no more than a small bit of the dough from which the god was made, for it was to be eaten in the manner of taking communion. 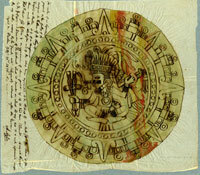 This ceremony has been mis-interpreted in one or two school books on the Aztecs: we drew attention to this some time ago - follow the link below and see the rather nasty interpretation one book put on it! Some school books get it wrong!